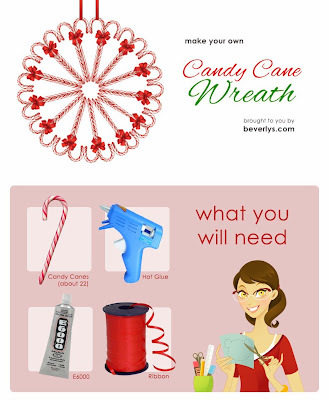 Beverly's Official Blog | News and findings from world of crafts, scrapbooking and more: Weekly How-To Project: Our Famous Candy Cane Wreath! Weekly How-To Project: Our Famous Candy Cane Wreath! A peek at our Candy Cane Wreath infographic! We know, we know: Christmas crafts already?! But this infographic for our classic Candy Cane Wreath was too good not to share a little early. This craft is one of our most popular how-to articles, so we decided to whip up a little visual aid to accompany it. View the full-size version of the how-to here on Pinterest, then re-pin to your Christmas craft board once you've skimmed it! The wreath makes a beautifully simply holiday decor accent, but it can also double as a gift! Try stringing it up from a doorway with ribbon, or adorn it with evergreen branches, holly or mistletoe to create a more robust version. No matter how you choose to customize this wreath, we know you'll have a sweet time doing it! Cynthia Coulter Wants You to Wine A Little!